Dr. Pat Woodbury has been elected chair of the Transportation District Commission of Hampton Roads, the governing body of Hampton Roads Transit (HRT). 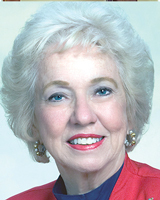 Her term began July 1 and runs until June 30, 2018. Hampton Roads Transit is the public transit provider for Hampton Roads and runs daily bus, light rail, ferry, express bus and paratransit services for Chesapeake, Hampton, Newport News, Norfolk, Portsmouth and Virginia Beach and covers a service area of 1.3 million people. 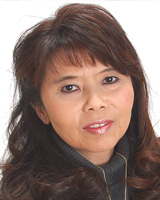 Polly Chong, attorney, counselor at law and certified mediator, attended a luncheon in Washington, D.C., with Justice Neil Gorsuch of the U.S. Supreme Court regarding a National Conversation on Civility, followed by a dinner in the U.S. Supreme Court building with comments focused on Achieving Excellence. C&F Enterprises teamed up with Delivering Good, a New York-based charity, to aid Hurricane Harvey relief efforts in southeastern Texas. The wholesale home décor, bedding, and gift company donated more than 140 quilts to those affected by the catastrophic storm. Colleen Hall is C & F Enterprises’ senior marketing manager. The top agents for August for CENTURY 21 Nachman Realty’s Peninsula Office were Chris Pray, top listing agent; Carla Stokes, top selling agent and top closing agent; Dee Karlsson, top producing agent; and Jamie Coldsnow, top referral agent. 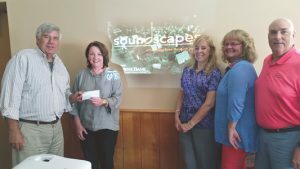 The Kiwanis Club of the Peninsula at Oyster Point presented a check for $600 to Soundscapes, an after-school music program that prepares first through third graders to perform in a primary-grade orchestra. Taking part in the presentation were (left to right) Orrin Banner, club president; Anne Henry, executive director of Soundscapes; Dawn Westmoreland, club secretary; Michelle Slabinski, club president-elect; and Barry Layman, club treasurer. Virginia Living Museum (VLM) honored 144 volunteers and acknowledged Cardinal Club Inductees, hourly and yearly volunteer milestones and the highest volunteer honor, The Gloria Lombardi Award for Volunteer Excellence. 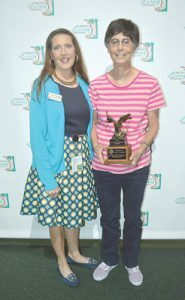 The Lombardi Award was presented to Vicky Lippolis, a volunteer for more than 20 years in animal care support, which involves exercising animals in the playground. She has contributed 3,823 hours of service. Claire Hubbard was also recognized as VLM’s first 30-year volunteer. Hubbard has performed many volunteer roles, including animal care and enrichment, special events and interpreting in many permanent and changing exhibits. 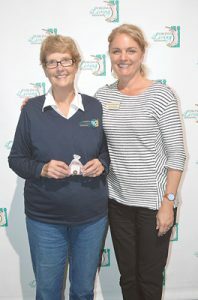 Elaine Whittaker was inducted into the museum’s Cardinal Club, an elite group of volunteers who have been with the Museum 20+ years or have 5,000 or more hours. Shown above left is Hubbard (left) with Rebecca Kleinhample, VLM executive director, and shown above right are Shandran Thornburgh, VLM volunteer services director (left), and Lippolis. Warwick at City Center Rotary Club received its first grant, Operation Warm, from Rotary International as a newly formed club in partnership with Operation Warm, the Peninsula Rotary Club and the Peninsula Metropolitan YMCA’s Bright Beginnings program to provide winter coats, school clothes and school supplies for 954 under-served school children in the greater Hampton Roads area. 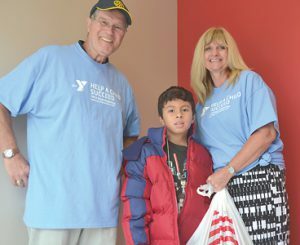 The Y’s Bright Beginnings outreach program, begun in 2003 and funded by generous donors and community organizations, is designed to help underserved children return to school each fall with new clothes and school supplies. The Rotary grant provided funds for the purchase of the coats, along with a generous contribution from the Oyster Point Rotary Club. Target and Kohl’s department stores were important partners in this effort. Shown here are Jim Probsdorfer and Gee Horton, Warwick at City Center Rotary Club members, with their shopper. The club inducted John Murray as a new member. Murray is a property manager with Kiln Creek Realty. 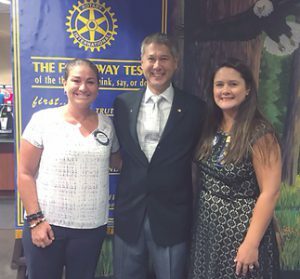 He is shown here with Jennifer Goudy, membership chair (left) and Jennifer Daknis, club president. 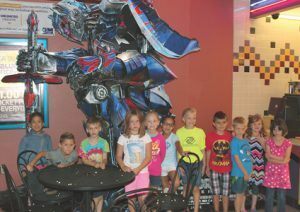 The Boys & Girls Clubs of the Virginia Peninsula was awarded a $7,500 grant by Regal Movie Express Grant, allowing many of its club youth to either take field trips to a local Regal theatre or to enjoy a “movie-going” experience at the club. Shown here are youth attending the movies this summer. Katie Babb, CPA, with Dixon Hughes Goodman in its Newport News offices, has been promoted to senior associate–assurance services. Babb received a Bachelor of Science degree in accounting and a Master’s degree in accounting and information systems from Virginia Tech. 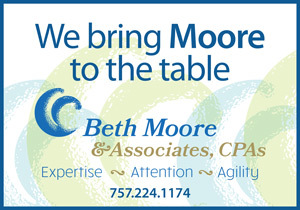 She provides audit and accounting services to not-for-profit and governmental clients. Scott Motley, Newport News deputy commissioner of the revenue, has been awarded the title of Master Deputy Commissioner of the Revenue, under the Master Designation program administered by the University of Virginia’s Weldon Cooper Center for Public Service and the School of Continuing and Professional Studies. The program was developed to enhance the professionalism of local government officials and their staff and is sanctioned by the Virginia General Assembly. Motley joins Dava Kauffman, Priscilla Green and Denise Barnes in the Newport News Commissioner of the Revenue office, as they each had previously received the same designation. Evergreen Workshop has opened near City Center at 11838 Canon Boulevard., Suite 500. With expanded workshop, warehouse and showroom space, Evergreen Workshop serves the musical community with a focus on instrument rentals and sales. The workshop also makes and restores instruments. 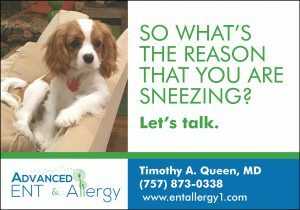 Richard Allen is owner and can be reached at 866-474-2722, 757-707-8332 or info@evergreenviolin.com. November events scheduled by the Virginia Peninsula Chamber of Commerce include Coffee Connection, November 7; Business Education Seminar, November 7; Business Education Seminar, November 8; Pink Bag Lunch, November 9; Military Recognition Luncheon, November 14; Peninsula Chamber Senior Advocate Roundtable (PCSAR), November 15; Bridge, November 16; Peninsula Executive Leadership Forum, November 21; and Business Connection After Hours, November 30. For registration and additional information, go to www.virginiapeninsulachamber.com/events/calendar/2017-11-01. Danny Carroll, a 40-year YMCA veteran who has served as CEO of the Peninsula Metropolitan YMCA for more than 25 years, will retire effective March 31, 2018. Carroll retires as the longest serving leader of the Peninsula Metropolitan YMCA during its 121-year history. Berkshire Hathaway HomeServices real estate brokerage network ranked “Highest Overall Satisfaction for Repeat Home Sellers Among National Full Service Real Estate Firms” in the J.D. Power 2017 Home Buyer/Seller Satisfaction StudySM. The 10th annual study measured customer satisfaction among the nation’s largest real estate brokerage companies and their agents through March and April. The study was based on responses from 4,170 consumers. 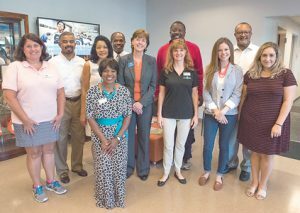 The Virginia Peninsula Foodbank celebrated Hunger Action Month in September with its annual Local Elected Officials Volunteer Day. Representatives participated from both the state and local level. Although not all are pictured, more than 20 elected officials packed 995 backpacks for the weekend Food for Kids BackPack Program and 624 USDA bags for the Mobile Food Pantry Program. Drucker & Falk has been named a finalist for the “Best Places to Work In Multifamily,” its second year on the list by the national Multifamily Leadership Program. Recognized as one of the top U.S. multifamily apartment management companies, the honor is the result of a rigorous evaluation process. Jim Ledbetter is president of the firm. Ted Rogers, who holds a joint appointment position with Jefferson Lab and Old Dominion University, and Justin Stevens, who holds a bridge appointment position with Jefferson Lab and the College of William & Mary, were among 59 winners to receive 2017 Early Career Research Program awards from the DOE’s Office of Science. Rogers and Stevens will each receive, on average, $150,000 each year for the next five years to support their work.